In the midst of summer’s heat with the Tour de France over and a spicy Vuelta a Espana yet to come those chilly spring classics seem but a distant memory don’t they? Don’t despair though, for Monday sees the start of the 15th Eneco Tour featuring enough cobbles, bergs, and Ardennes specialities to keep us going until next year’s Omloop het Nieuwsblad. It’s best described as everything we love about the spring classics rolled into seven stages of racing with a time trial in the middle. The race straddles both the Netherlands and Belgium and the organisers have definitely made the best use of all the varied terrain they can run their race through to provide a parcours designed for good attacking racing. Stages one to three are big days for the sprinters but they won’t be straightforward and simple. The 183.5km opening day circuits around Bolsward are likely to be spiced up with the threat of crosswinds and echelons, while the finishes for stages two and three feature technical run-ins that will keep the sprint trains on their toes. Stage four is a short 13.9km time trial which starts and finishes in the cyclo-cross heartland of Hoogerheide. The course is a straightforward loop and shouldn’t cause too many problems, but as always a time trial in a one-week stage race is going to be important to those riders with an eye on the podium. The fast men will have had their fun in the first three stages, but stages five to seven will have the classics specialists drooling. 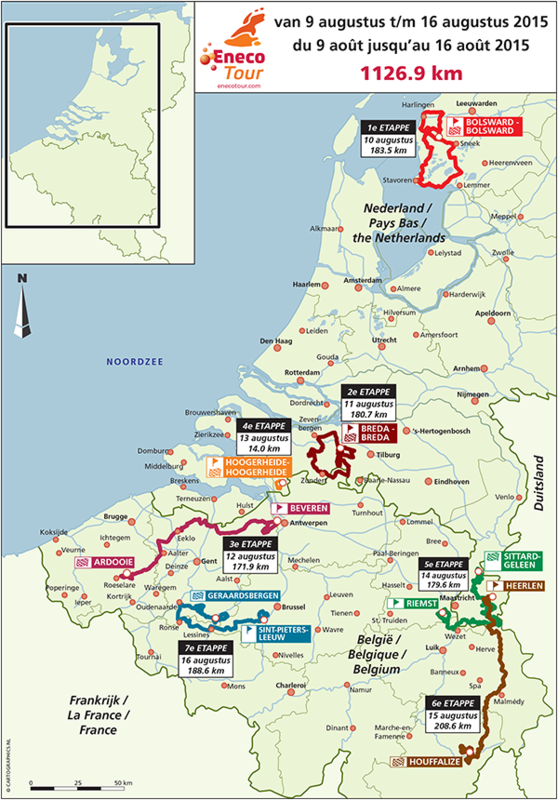 Stage five is mini-Amstel Gold day – 179.6km over 23 bergs with only one of them less than 5%. The peloton head over the Gulperberg (430 metres at 9%) and the Eyeserbosweg (800 metres at 8.2%) before they tackle two laps of finishing circuit back-loaded with four climbs. The riders might wish for a rest day about now, but no such luck as next they face the longest stage with a distinctly Liege-Bastogne-Liege flavour to it. Unlike La Doyenne stage six is only 198km which is short enough to produce some great attacking racing over the 15 climbs on the menu. With nine of these coming in the last 70km, including three eye watering ascents of the 11% Cote de Saint-Roch, the finale will be fierce, feisty and not for the faint-hearted. In the 2014 edition the Ardennes provided the excitement on the last stage. This year the race will finish with a cobbled crescendo – oh yes, at last it’s Ronde van Vlaanderen day. 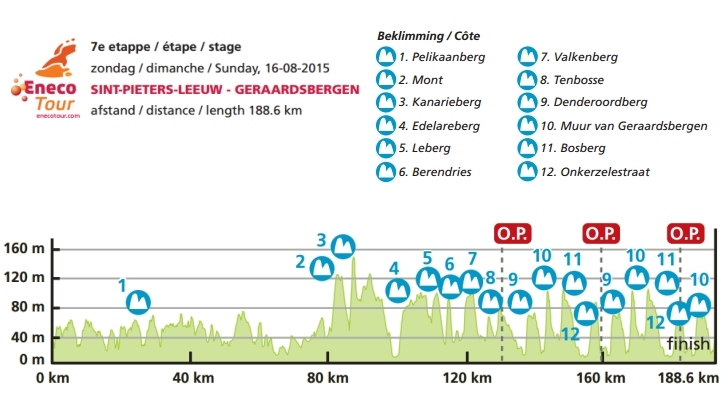 Just look at that profile: 193.8km, 16 climbs in the last 100km and a finish on the iconic Muur van Geraardsbergen. Name me a classic’s rider who won’t go all out to win this one? My tip – Do Not Miss It. There are bonifications for each road race stage: the usual ten, six and four seconds for the first three riders over the line, plus the appearance of the golden kilometre. This new innovation features three intermediate sprints within one kilometre each scoring three, two and one seconds. The varied parcours and position in the race calendar always make this race tricky to pick a winner for the overall. It’s even trickier this year with the cobbled stage last on the agenda. It will be all too easy for the unwary Ardennes specialist to lose any time they may have gained on the previous stages. BMC come with a strong team featuring Philippe Gilbert and Greg Van Avermaet. Both have been on sparkling form recently and either is capable of a podium finish. However, on balance I’m going to plump for Greg to take his first WorldTour win. He’ll be especially keen to put the disappointment of San Sebastian behind him and his time trial has improved. My outsiders for a top ten GC finish are Simon Geschke (Giant-Alpecin) fresh from his Tour de France glory and Marco Marcato (Wanty-Groupe Gobert) who’s just finished third at the Tour of Denmark and always does well at this race. Outside of the GC, there are many riders who have a great chance of stage-winning glory. If Andre Greipel (Lotto-Soudal) is carrying anything like the speed he had in the Tour I can’t see many getting past him in the sprint stages. One in with a shout is my outside pick Edward Theuns from Topsport-Vlaanderen-Baloise. The young Belgian was second at both Scheldeprijs and Dwars door Vlaanderen, and knows these roads like the back of his hand. Look out for Niki Terpstra (Etixx-Quick Step) and Tinkoff-Saxo’s Chris Juul-Jensen on the time trial. For the Ardennes type stages I rather fancy the chances of Julian Alaphilippe (Etixx-Quick Step) or perhaps Fabio Felline (Trek) to get on the podium. As for the cobbled last stage, COME ON! who wouldn’t love to see Tom Boonen (Etixx-Quick Step) storming the Muur? Definitely keep an eye on Tiesj Benoot (Lotto-Soudal) on the last stage after his fine fifth place at the Tour of Flanders this year, and perhaps it might even be a day for Matti Breschel (Tinkoff-Saxo) fresh from making stage winning history at his home race. Well, I can always dream!